Please join us tonight at 7pm mountain time for our final Twitter chat. 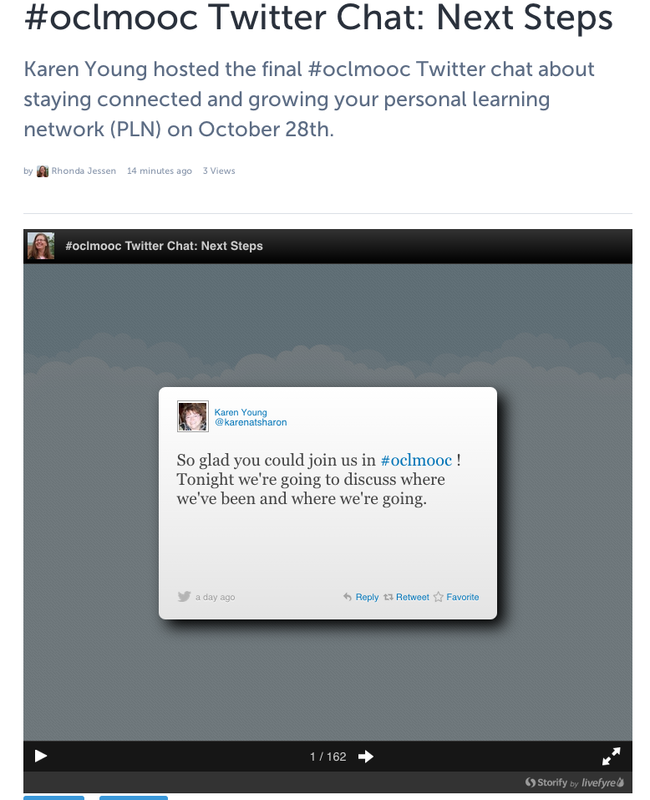 We’ll be talking about our experiences during #oclmooc, reflecting on our learning, and how to continue to grow our personal learning networks after #oclmooc ends. As we were chatting about Open Leadership last night Susan Spellman Cann was archiving the chat via Storify. Her archive was available as soon as the chat ended; it was the quickest curating I had ever seen! Unfortunately the embed code that Storify generates isn’t working, to view it you’ll have to click on the image or this link. Please join us tonight at 7pm mountain time for an #oclmooc Twitter Chat about Open Leadership. This is the last synchronous event for week 4. Here is the archive of the Open Leadership webinar we held on October 16th with Christina Hendricks and Dr. Erin Mason. The link will open in Blackboard Collaborate, here are instructions of how to access Blackboard Collaborate if you’re unfamiliar with its use.